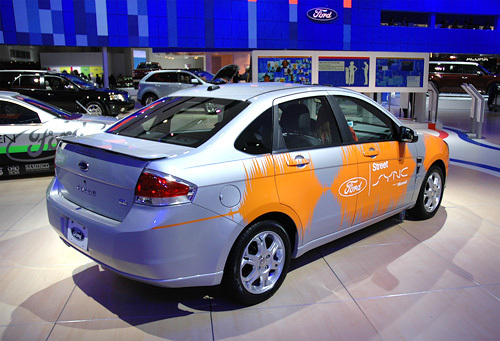 [NAIAS 2008] Hands-On With The Ford SYNC System | OhGizmo! At the top of my list of things to see at the NAIAS this year was Ford’s new SYNC system. The company has been heavily marketing it as of late, and I’m sure any of you who are addicted to TV as much as me have seen the clever ‘Michael Bolton’ ad they’ve been running. At its core, SYNC is a voice recognition system that ties together your car’s stereo with your cellphone and MP3 player. A USB jack hidden in a compartment between the front seats allows you to connect any iPod (except the shuffle) or a Zune (given the SYNC software was developed by Microsoft) which then gives you access to your MP3 collection through the car stereo. Any time you want to initiate a voice command there’s a button on the steering wheel you need to press, but otherwise searching through your music and playing a particular genre or artist is pretty much hands-free. And besides the slick voice recognition stuff, I think people will particularly like the SYNC’s ability to communicate with your cellphone via bluetooth. Now bbviously your phone has to have bluetooth capabilities in order for this to work, but based on this compatibility list on the SYNC website, it looks like a good majority of current phones on the market will work just fine. Once connected you’re not only able to make and receive calls via voice recognition, but you also have access to everything on your phone from your contact list, to MP3s, to even ringtones. The system is even able to hand-off or receive phone calls from your cellphone if you’re in the middle of a conversation while exiting or entering the vehicle. Another clever feature is SYNC’s ability to read back text messages you get while driving. It’s even smart enough to recognize smiley faces, or LOL shortcuts, though I have to admit hearing a computer voice read back ‘laugh out loud’ takes away some of the dramatic effect. At the moment you’re limited to responding to text messages with one of 15 preset messages, but I was told that the ability to dictate a custom response should eventually be included. While it would be nice if everyone just stopped using a cellphone while driving, it’s just not going to happen. So providing a system like this that at least keeps the drivers hands on the steering wheel is a big improvement. Admittedly, after having the chance to demo the system I walked away with some mixed feelings. Overall I think Ford is on the right track, but when it comes to bells and whistles and polish, I still think the entertainment/navigation system offered on the Cadillac CTS runs circles around SYNC. For the most part they’re matched feature for feature, but the CTS system pulls ahead with the 40GB hard drive and OnStar navigation system. However, the biggest advantage that Ford has with SYNC is that they’re offering it on a wide range of vehicles they sell. This includes everything from their high-end luxury cars, to the ‘college-friendly’ type vehicle they were actually demoing the system in. While the demo car had a very basic stereo system, with a particular low-tech display, the SYNC system functioned exactly as it would have in a higher-end vehicle. And since I see this system appealing mostly to younger drivers, that’s definitely the type of vehicle a system like this needs to be available in. And speaking of OnStar, when I first read about SYNC I immediately thought it was Ford’s answer to GM’s own popular navigation/emergency response system. While the current multimedia capabilities of SYNC don’t necessarily put it in the same category as OnStar, some of the features that are expected to be available in the fall of this year do. For starters they plan to introduce a ‘911 Assist’ feature that will automatically dial 911 in the event your vehicle’s airbags are deployed. You can then talk to a 911 operator hands-free, or opt to play a pre-recorded message if you can’t reach your phone. SYNC should also be getting the ability to asses the ‘health’ of your vehicle, and provide this info to you via a ‘Vehicle Health Report’ available on the SYNC website. Since both of these features have already been available with OnStar for some time now, I’m pretty sure this is Ford’s attempt to play catch up in that regard. Even though it’s just the first version, I think Ford and Microsoft have done a pretty good job with the SYNC system. They’re marketing it towards the right people, and the $395 price tag on vehicles where it’s not standard is relatively reasonable given its capabilities. While it might not be as feature rich as the systems available from other companies, it seems like a good starting point for where Ford and Microsoft intend to eventually take it.